I recently received a little black box via Fedex. Interesting I thought, I wonder whats inside. Too small to be wine, too big to be a book. Well it turned out to be wine, six little 50ml wine bottles! There was a little information card that explained what the acronym means…Total Anaerobic Sample Transfer Environment. Basically the wines “are transferred directly from finished bottles within a sealed, zero oxygen chamber…” The wine makers sample the samples and make sure they taste right and then the wine is shipped off to the consumer. Why would you want to buy such small bottles? Because maybe you don’t want to shell out $50 and $60 a bottle to find out what a wine tastes like. The Tasting room allows you to try out 6 different wines for about $30. But is 50ml enough? It’s enough wine for about a quarter to a third of a glass, its enough to get an initial idea on whether or not you should purchase a real bottle. One thing to note is that because of the tiny format the wine has a relatively short shelf life. It’s best to consume the wine within a month of receiving it, and there is a helpful “best before” date right on the back of the bottle. 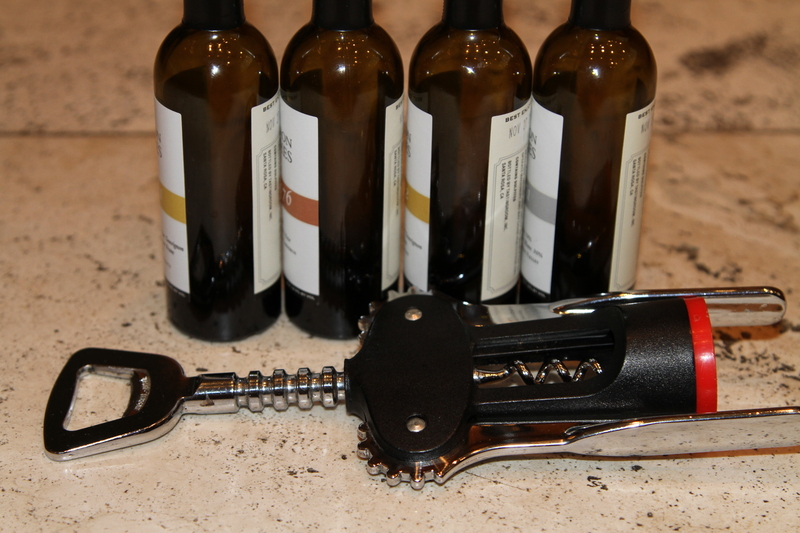 The bottles feature stelvin enclosures so you don’t need a tiny corkscrew.